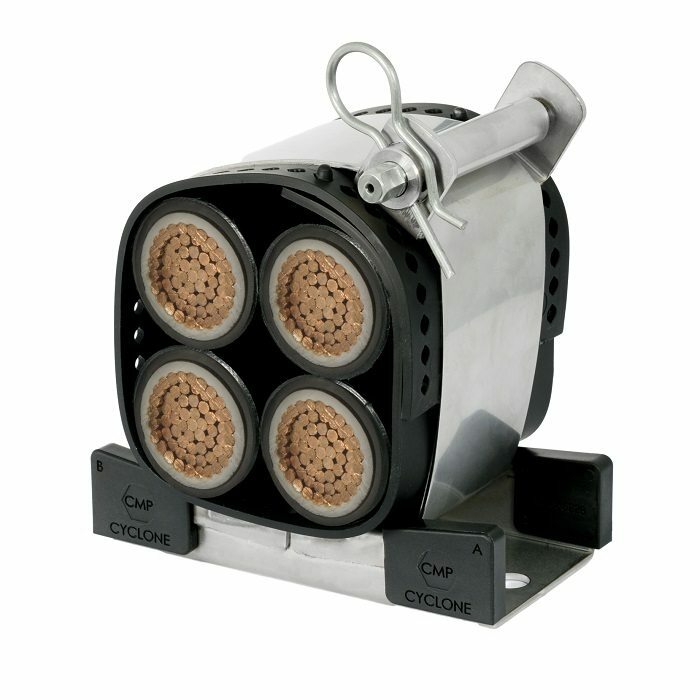 The Cyclone II Strap cable cleats are metallic cable cleats consisting of a fabricated 316L stainless steel base and a stainless steel strap which have been designed, constructed, and tested in accordance with the International Standard ‘cable cleats for Electrical Installations’ IEC 61914. The Cyclone II Strap cable cleats ensure the retention and securing of cables, whilst preventing damage to the cable when in normal operation or in the event a short circuit fault condition. The Cyclone II Strap cable cleat is designed and tested to restrain cables securely during moderate short circuit forces and its straps are designed to wrap around the cables twice. The Cyclone II base is manufactured from 316L stainless steel, giving the cable cleats high creep strength and excellent corrosion resistance. The Cyclone straps are manufactured in 316L stainless steel providing excellent corrosion resistance, and the tensioned straps act as a coil during short circuit conditions to restrain the cable. The Cyclone strap wraps around the angled Cyclone II stainless steel base ensuring the cables are always kept central, the strap is fastened to a stainless steel pin with a hexagon shaped head at one end allowing fast, easy installation via the use of a ratchet, power tool or other suitable mechanical device. The Cyclone II Strap cable cleats have one M12 and two M10 fixing clearance holes within the base, allowing versatile installation, and enabling the product to be secured to a variety of mounting surfaces. 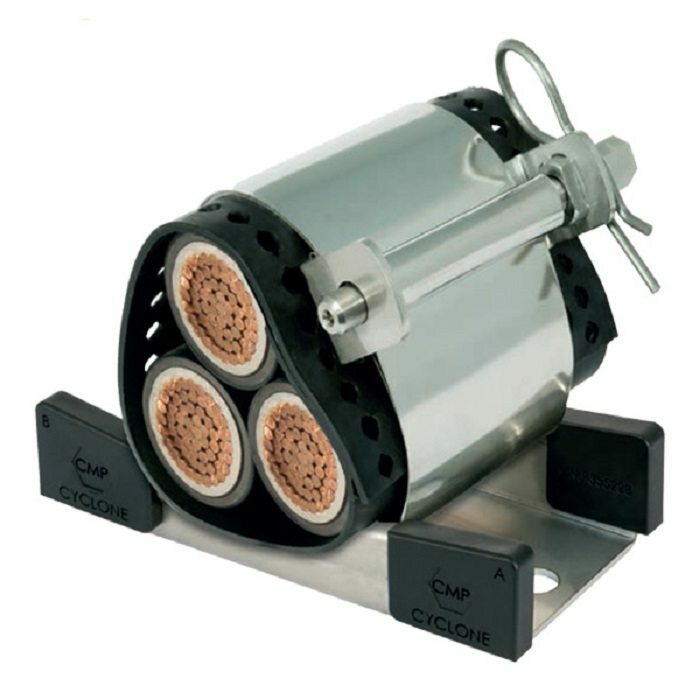 Due to the design of the Cyclone, the cables do not need to be lifted and placed in to the cable cleat, instead the cables are placed on to the bases and the Cyclone straps then wrap around the cables securing them to the mounting surface of the base. The Cyclone II cable cleats and Cyclone intermediate straps come with standard liners, which are classified as Low Smoke & Fume (LSF), Zero Halogen (LS0H) and Phosphorus free. A high temperature version of the liner is available by adding HT suffix to the ordering code. 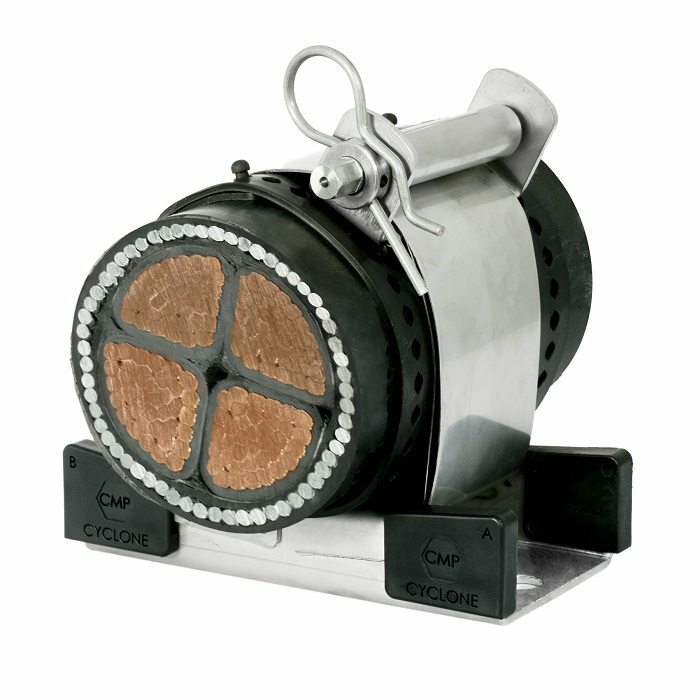 The liners help to restrain the cables within vertical applications, providing a layer of protection between the cable sheath and the Cyclone stainless steel strap and base during normal operation where thermal elongation of cables occurs. 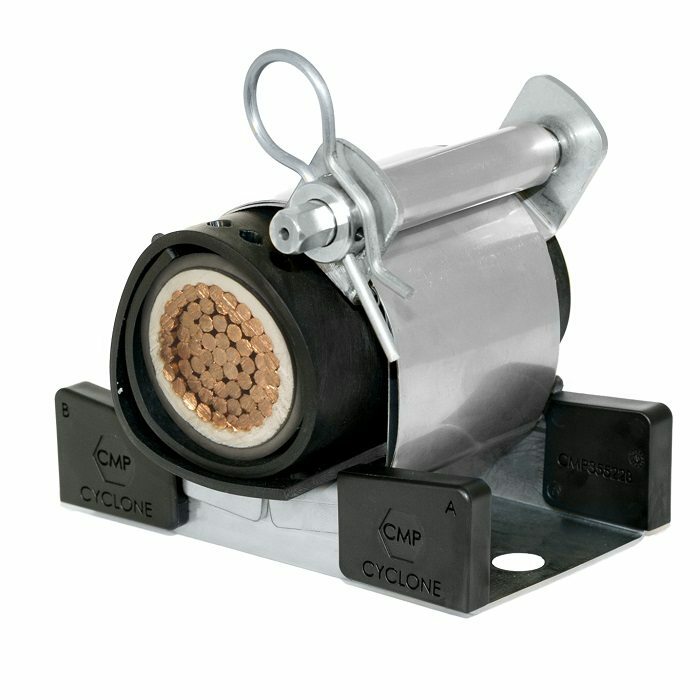 The liners also prevent the cable from chafing on any mounting surface due to differential movements such as those found in marine and offshore applications, and protect the cable during short circuit conditions. Note: The Cyclone II cable cleat consists of one base and one strap, additional cable straps (restraints) ordered separately. Coatings are available upon request by adding the following suffixes to the ordering reference – EC for epoxy coating, PC for polyester coating and TC for thermoplastic coating. Order reference example for epoxy coating of cable cleat base suffix EC (2CYC024034EC). Order reference example for high temperature liner version suffix HT (2CYC024034HT). Fasteners required to secure the cable cleat to the support structure are not included but can be supplied upon request. Isolation/separation pads (to prevent corrosion between two dissimilar metals) are not included but can be supplied on request - see isolation / seperation page.